While visiting the Xbox Japan offices, Rare gave a Banjo-Kazooie: Nuts and Bolts walk through, talking up the game. 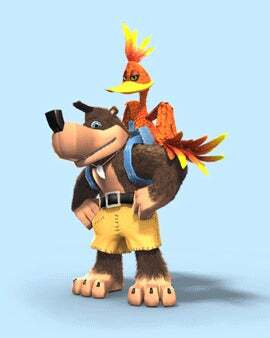 "It's good to be back in Japan, because Banjo was inspired by Japan," studio boss Mark Betteridge. Apparently, the character's backpack was inspired by backpacks that Japanese children carry around. Rare's being especially bullish about online — creating a team dedicated to multiplayer — and about the game's creation aspects. In the age of LittleBigPlanet, competition is stiff, but Rare's confident in all the various vehicles players can make in Nuts and Bolts. When asked if there's the possibility for one proverbial user-created vehicle that could break the game, Betteridge replied: "I hope not. We are confident that we built a substantial world... No, it won't crash."